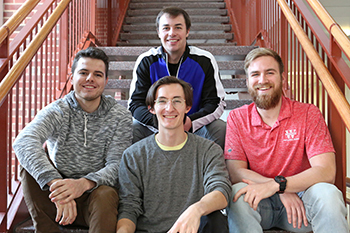 For the second consecutive year, four Wabash College seniors have earned Orr Fellowships, guaranteeing them two-year, salaried positions with a host company in Indianapolis. As Orr Fellows, William Bernhardt, Caleb Larson, Jack Leppert, and Braiden Slavens will receive executive mentorship and participate in a curriculum designed to develop understanding and skills vital to the spirit of entrepreneurship and business leadership. In order to be considered for an Orr Fellowship, a student must demonstrate leadership potential on and off campus, have a cumulative 3.5 GPA or higher, have extensive leadership experience, and have a strong interest in entrepreneurial business or organizational leadership. William Bernhardt of Crown Point, Indiana, is an economics major with minors in computer science and business. He will be working at the technology consulting company Onebridge. Bernhardt is looking forward to the social aspect of the Orr Fellowship, which is designed to create an extensive peer and alumni network. Fellows spend a lot of time together outside of official program events, going to festivals, enjoying Indianapolis’ sports scene, and participating in volunteer opportunities. Caleb Larson of Kendallville, Indiana, is a financial economics major with a minor in computer science. A member of Kappa Sigma and Alpha Phi Omega, Larson will be working at the business and technology consulting firm KSM Consulting. Larson hopes to be an entrepreneur someday and hopes the Orr Fellowship will help him get there. Jack Leppert of Indianapolis is a financial economics major with a Spanish minor and is a member of the CIBE, the Inter-Fraternity Council, and the Sphinx Club. He will be working at Canvas Talent, Inc., which was started by Wabash alum Aman Brar ’99. Canvas is a young startup company with only eight employees, and Leppert plans to use the lessons and best practices he learns there to gain experience in marketing, sales, communication, and, hopefully, start his own company one day. Braiden Slavens of Crawfordsville, Indiana, is a religion major with a biology minor. He is the president of the Inter-Fraternity Council and is a member of the Sphinx Club, Theta Delta Chi, Sons of Wabash, the Wabash Car Club, and Soccer Club. He will be working at TerraBoost Media. “The Orr Fellowship provides its fellows with a Wabash-like community focused on developing industry leaders and overall better people,” Slavens said. By being placed in a position where he must understand all aspects of the business in order to succeed, Slavens knows his time at TerraBoost Media will strengthen the leadership and interpersonal skills he has gained at Wabash. In the past 10 years, 18 Wabash men have earned Orr Fellowships. Previous host companies have included Angie’s List, Exact Target, and IU Health, and many of the College’s Orr Fellows have gone on to start their own companies.